The ancient salt mines of Wieliczka have been turned into a museum, and it is a fascinating place to visit when in that area of Poland. The mine is on the original UNESCO list of World Heritage Sites. 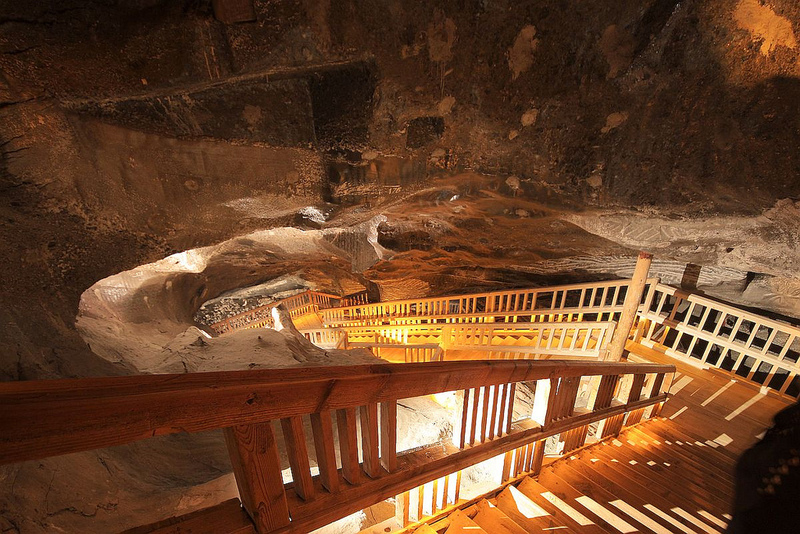 To get down to the mine you have to descend 378 wooden steps. The tour of the mine is three kilometres, and shows you everything from corridors to chapels, from statues to the underground lake. Fortunately you don’t have to walk back up all those steps as there is an elevator back up to the surface. You’re not allowed to visit the salt mine alone; you need to have a tour guide with you. Although this means you’ll have to hang around to wait for a group (about 35 people) to be put together, it does mean that you’ll have access to a wealth of information about the mine as you go round it. There are guided tours in multiple language — call ahead to make sure you arrive at a time where you’ll be able to understand what your guide is saying to you. If you want to take photographs in the mine it’s an extra zł 10, but it’s worth it; they are as stunning as they are interesting. Dotted around the mine are several places to eat and drink, so a packed lunch isn’t necessary, but do bring some extra cash in order to buy bags of salt from the mine in one of the several shops and souvenir stands.